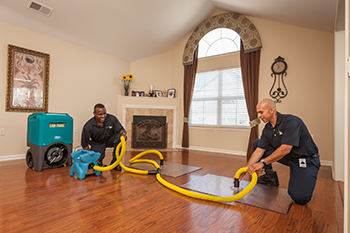 Contact ServiceMaster Cleaning & Restoration Pro. We are open 24/7 for all of your water damage restoration needs. Remove items that are not attached to the floor, such as rugs and coffee tables. Take measures such as blotting or mopping to remove as much water as you can. Lift curtains off of the floor. Place foil under heavy furniture that you can’t remove. Relocate any valuables that could be damaged by humidity or water – photos, jewelry, artwork, etc. Open and aerate all closed-off areas, such as drawers, cabinets and closets. There’s no need to be shocked (literally) – Avoid entering a room with standing water until you have turned off all electricity. Avoid entering a room that has a sagging roof or ceiling due to water. Don’t use electrical appliances while standing on wet ground. Avoid coming into contact with any mold. Don’t turn on the lights in a room that may have water damage. Don’t use a vacuum to clean up the water.